Last week, HERL Director Dr. Rory Cooper was Distinguished Visiting Faculty at Loughborough University, United Kingdom. He and Prof. Rosemarie Cooper met with faculty interested in collaborations, and provided feedback on research and student activities. "The facilities and people there are very impressive. Loughborough University is where Sebastian Coe, the great middle distance runner and Olympic Champion, went to college. 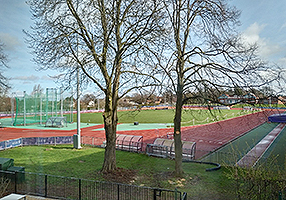 It is also home to the British Athletics National Performance Institute and the the Peter Harrison Centre for Disability Sport. There is an amazing athlete hotel and the dorms even include altitude controlled rooms to simulate high elevations. There are many accessible rooms that have been well designed. Faculty are working on such interesting experiments as hand-bike optimal positioning, soccer ball optimization, and sport safety equipment. It is a great combination of engineering, design, sport and exercise science. It was very interesting to learn about the Institute for Advanced Studies, which brings faculty across campus together as well as global experts to campus to build collaborations." See the photos on the HERL Facebook page.